The drawing is done in pencil and ink with paint and spatter on a high quality 3-ply Hero Initiative illustration board. The board measures 6.5-by-10 inches. This drawing was part of "Wake Up and Draw, " a yearly celebration of Jack Kirby's birthday on August 28, presented in conjunction with Kirby4Heroes. For more information, please search for Kirby4Heroes on Facebook. This drawing has been generously donated by Bill Sienkiewicz. 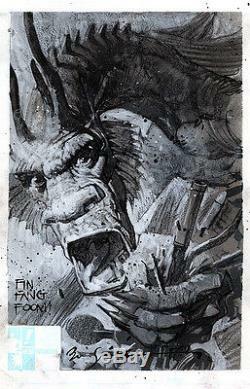 The item "BILL SIENKIEWICZ Fin Fang Foom Kirby4Heroes Wake Up and Draw original drawing" is in sale since Tuesday, September 06, 2016. This item is in the category "Collectibles\Comics\Original Comic Art\Drawings, Sketches". The seller is "heroinitiative" and is located in Los Angeles, California. This item can be shipped to United States.